½ lb chicken cooked and deboned. Cut into small pieces. 1. 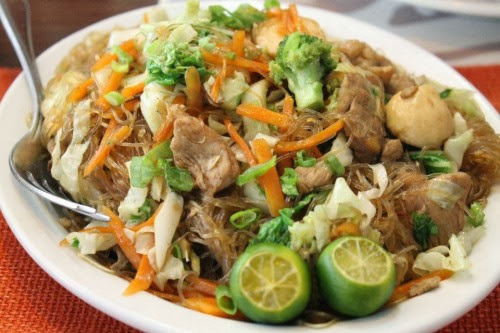 Place the Pancit Bihon in a container and soak in water for 10 minutes. Set aside. 2. Saute garlic and onion in a large pot. Add the chicken, pork, squid balls, and Chinese sausage and cook for 2 minutes. Add water and chicken cube then simmer for 15 minutes. 3. Add the carrots, cabbage, and celery leaves. Simmer for a few minutes. 4. Remove all the ingredients except for the liquid left and set aside. 5. Using the same pot with the leftover liquid, add the soy sauce and mix well. 6. Add the pancit bihon and mix well. Cook until liquid evaporates completely. 7. Add the meat and vegetables that were set aside previously. Cook for a minute or two. Season with salt and pepper to taste. Serve with calamansi. Tip: You may also add boiled chicken liver, gizzard and heart to add flavor to your dish.